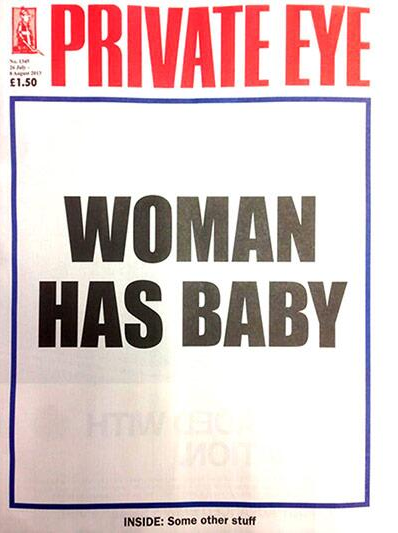 The best Royal Baby newspaper front page. Katie on why the Royal Baby should have been a girl. What you need to know about military sexual trauma. SURJ has released a Justice for Trayvon Martin activist toolkit for white people. Dreamers take a huge risk to return home. On forced sterilization in India and horror films. USC and Dartmouth are both being investigated by the Department of Ed for mishandling sexual violence. The War on Drugs is really the War on Blacks. Who is the Saddest Girl in music? Good job, team. Let’s gender losing teeth. It’s about poverty, not crack. The case for radical empathy. The best analysis of “Orange is the New Black” I’ve seen. Women don’t know how to buy cars, dummy. Speaking of which: Being Miranda. The Lip Magazine feminist of the week is Suzanna Bobadilla. Alexandra Brodsky was a senior editor at Feministing.com. During her four years at the site, she wrote about gender violence, reproductive justice, and education equity and ran the site's book review column. She is now a Skadden Fellow at the National Women's Law Center and also serves as the Board Chair of Know Your IX, a national student-led movement to end gender violence, which she co-founded and previously co-directed. Alexandra has written for publications including the New York Times, the Atlantic, the Guardian, and the Nation, and she is the co-editor of The Feminist Utopia Project: 57 Visions of a Wildly Better Future. She has spoken about violence against women and reproductive justice at campuses across the country and on MSNBC, ABC, NBC, CBS, CNN, FOX, ESPN, and NPR. Alexandra Brodsky was a senior editor at Feministing.com. On Friday, September 7th, six activists from Chicago South Asians for Justice stood up in the middle of the plenary panel of the World Hindu Congress in Chicago to voice their resistance to the Hindu nationalist political movement currently ascendant in India.